This Nativity set of wire and beads is made by Rabson. The beads used in these figures are high-quality glass beads rather than plastic beads. 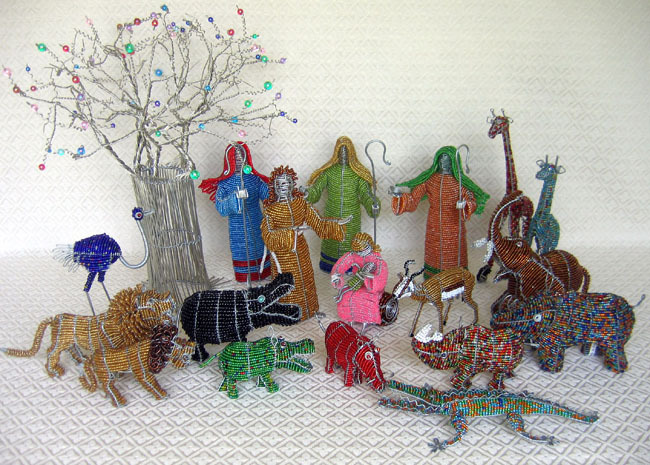 The set includes Joseph with curly hair, Mary sitting on a log while holding baby Jesus, three wise men with gifts and staffs, a baobab tree, and thirteen African animals (pictured from left): an ostrich, a mamma and baby lion, a mamma and baby hippo, a warthog, a crocodile, a springbok antelope, a baby and mamma rhino, an elephant, and a mamma and baby giraffe. The springbok antelope and other large cattle are Rabson’s specialty. He began making Nativity sets only after we saw his intricate animals and asked if he would try Nativities. The wise men figures measure 7.5 inches tall. The springbok is the national antelope of South Africa. This buck is well-known in the bush for its ability to spring far and high at regular intervals, hence its name. It is widely known worldwide as the proud national emblem of South African sports teams, in particular the national rugby team. The South African Springboks are the reigning rugby World Champions, and their victory at the 2007 event sent the entire country into delirium! Everywhere one goes in South Africa, one sees the springbok emblem. It is the emblem that unifies and typifies the new, multi-racial South Africa. Rabson is a charming young man who grew up in a village in Zimbabwe. His parents were too poor to send him to school so he does not speak much English. He has been a refugee in South Africa for one year due to the terrible economic and political crisis in his homeland. Since the creation of a new government in Zimbabwe in 2009, Rabson wants to go back home because it is easier to survive hardship in one’s own country than to be in a country that is openly hostile to refugees. Artisans like Rabson sell on street corners in Johannesburg and quietly display their beautiful sculptures. Frequently, the police come by and confiscate all of their pieces and give them stiff fines that they cannot pay. The artisans lose everything and have to start over again, so the more vulnerable refugees are seriously looking to leave South Africa.